Many in the Texas solar industry are worried a federal agency might hobble their business in an effort to protect domestic manufacturers of solar panels and cells. A recent solar energy boom in Texas and other states could be hobbled, critics warn, if a federal agency agrees to levy taxes or other protective measures on solar products made abroad. The U.S. International Trade Commission is scheduled to hold a hearing Tuesday to consider imposing a tariff or price floor on imports of solar panels and cells to help domestic manufacturers compete. But opponents hope to convince the commissioners that protectionist policies would harm the bulk of the industry that works with solar panels and cells but doesn't manufacture them. The commission voted 4-0 in September that the amount of solar cells and panels being imported into the country was causing “serious injury” to domestic manufacturers. Next month, the commission is expected to send recommendations on how to address the issue to President Donald Trump, who has broad latitude to determine what course of action to take. He is expected to make a decision in December or January. That decision could be acutely felt in Texas, where the solar sector has grown significantly in recent years, due in part to an influx of cheap products from abroad. The Texas solar industry added 2,366 workers in 2016, a 34 percent increase on the previous year, according to The Solar Foundation, a solar advocacy group. About a third of the state's solar jobs are in manufacturing, Foundation data shows. 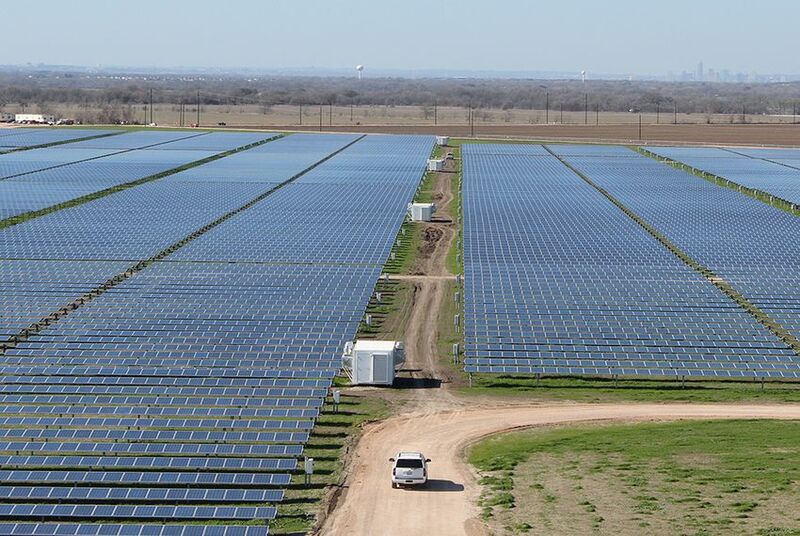 “We're seeing a tremendous amount of market growth here in the state; we doubled our solar capacity here in Texas last year, support over 15,000 jobs and billion dollars of salaries and wages, and to see something that might hinder the industry is not helpful,” Hemmeline said. The two solar panel manufacturers behind the complaint – Georgia-based Suniva Inc. and Oregon-based SolarWorld Americas Inc. – have asked for temporary protection from foreign competition. “The industry has suffered staggering losses in revenue and profit because of the import surges ... and now is in such a severely weakened financial condition that almost 30 companies having gone out of business since 2012,” lawyers for Suniva wrote in a pre-hearing brief. The two companies have asked for the federal government to impose a four-year tariff on foreign solar cells and panels – starting at 25 cents per watt and 32 cents per watt, respectively, and becoming less severe over time. While SolarWorld also requested an import quota on cells and panels, Suniva asked that imported solar panels face a price floor of 74 cents per watt. Combined, the measures will incentivize solar manufacturing and investment in the country, and allow the “industry to recover domestic market share,” SolarWorld’s pre-hearing brief says. The company predicts at least 35,000 jobs – including nearly 10,000 in direct manufacturing – would be created by the proposed remedies. But the companies face opposition from the majority of the solar industry, as well as from several foreign governments – representatives of whom filed briefs and are expected to attend the hearing Tuesday. Domestically, one of the biggest concerns is that raising the price of imported panels would increase costs downstream – reducing demand for installation and other service-oriented jobs that make up a bulk of the industry’s workforce. A leader of the Solar Energy Industries Association, a national trade group fighting the case in Washington, D.C., says manufacturing jobs make up about 15 percent of jobs in the solar sector. “We are very interested in making sure the rest of the solar industry does not get devastated as a result of” the enacted remedy, said Abigail Ross Hopper, the association's CEO. In its pre-hearing brief, the association argued against imposing any tariff or price floor and in favor of providing tailored relief to ailing domestic producers like Suniva and SolarWorld. Both companies have faced financial troubles of their own. The companies’ problems are “internal, not external,” the trade group argued in its brief, citing strategic missteps, lack of scale and “problems with quality, timeliness, and adequacy of supply.” It asked that the government provide job training, technical and financial assistance specifically to domestic companies – a solution it says will prevent harm to the industry at large. That harm – from a tariff, price floor or quota – could be considerable, said Bret Biggart, CEO of Austin-based Freedom Solar Power, a company that installs solar panels on residential and commercial properties like Whole Foods and Office Depot. Installers and service businesses, Biggart says, have a thin profit margin that "can't withstand a very big price hike like this and not have it flow through to the customer." He says end customers could see a price increase of 10 to 15 percent if the proposed tariff or price floor were put in place. "All else being equal, we're looking to buy American-made products when we can," he said. But "when you talk about increasing the cost of panels – which makes up 66 percent of the total price to the customer – and you're increasing it by that much, we're eroding that margin instantly. We can't take that margin erosion; we have to raise the price to the customer."